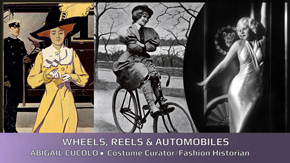 The University of Fashion is proud to announce a new Costume History Series to our Fashion Connections Lecture Series: Wheels, Reels and Automobiles and Keeping Up With the Jones’. These new lectures are taught by costume historian, Abigail Cucolo. Wheels, Reels and Automobiles, will take you on a journey of how the wheel influenced fashion at the turn of the 20th century. You will learn how three innovations- the bicycle, the automobile, and cinema – significantly affected what women wore, providing new outlets for freedom, necessitating the adoption of more practical clothing, and revolutionizing the dissemination of fashion trends. Let this lecture inspire you! 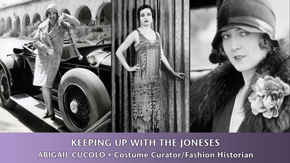 Keeping up With the Jones’ will explore the various luxury trends that women followed to stay fashionable during the 1920s. You will learn which designers, motifs, and styles were in vogue with the social elite that allowed for the display of wealth and status during the extravagant Jazz Age. The significance of historic costume goes far beyond the aesthetic. Its symbolism is potent and can display a wealth of information about a person and a society. This aspect of fashion is an excellent addition to any aspiring designer’s already impressive endeavor! Ever wonder what it takes to be a Costume Curator/Fashion Historian? Costume historians have a deep appreciation for fashion and the relationship it shares with history and art. Getting a well-rounded education helps and starts with earning a bachelor’s degree where you will be able to learn the complete production process of a garment- from concept to construction. Classes on draping, patternmaking, and sewing, as well as illustration, fashion history, business, and computer-aided design are a must! Earning a graduate degree in costume history takes advantage of the freedom to pursue individual study and the challenge to explore a particular area of costume history in-depth, culminating in a master’s thesis. Interning at a costume museum, lecturing on fashion history at industry events and getting fashion articles published also helps. Soon you’ll be on your way to being a costume historian!